Northern Ireland, 1972. The violent Troubles have forced Tom Martin to take drastic measures to protect his family. Across the divide William McManus murders for a cause. Yet both have underestimated the power of love and an individual’s belief in right and wrong, a belief that will shake the lives of both families with a greater impact than any bomb blast. Based in Mallorca where she runs Seven Rocks Consulting. Deirdre brings her vast experience of emotional intelligence and mindfulness to bear in her creative endeavours. she is the winner of the Alexander Imich Prize and the Birmingham Trophy Prize. 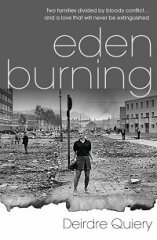 With its backdrop of the Troubles in Belfast in the 1970s, this is an important book. Sympathetic characters, well portrayed and a solid spine of conflict. This is a worthy winner! Very realistic backdrop of the time, well written and keeps you gripped throughout. I was also there, in Belfast in the 70s, in the rubble of what passed for civilization and I can honestly say that Deirdre captures it perfectly. The ability of my fellow Irish folk to simultaneously spew hatred at a faceless enemy (the 'Brits') and sacrifice themselves out of love for their own - it was real and Deirdre managed to convey this madness on paper with mere words. Amazing. Takes the reader into the heart of the Troubles in Belfast and, by introducing the reader to two families on either side of the sectarian divide, goes some way to explaining the background to the personal vendettas which fueled the bloodshed for so many years. A fine and well written story of ordinary people living their lives in an extraordinary time and place. In this tale both are brought vividly to life.